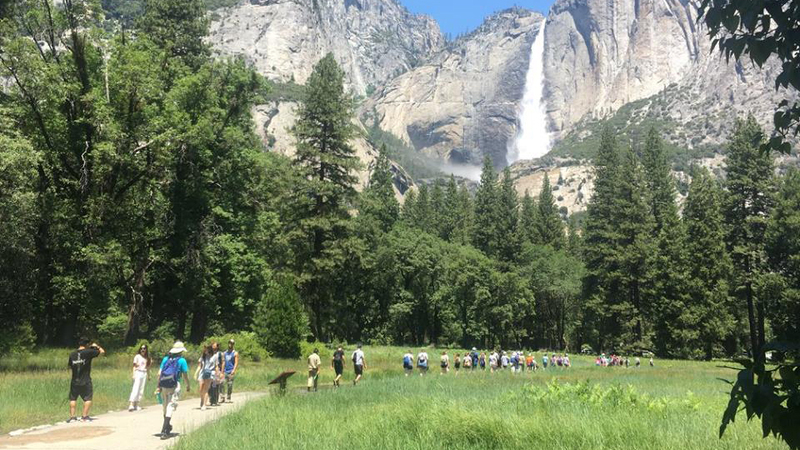 Young people hike in Yosemite National Park during the Pathways pilgrimage organized by the Diocese of Northern California from June 19 to 23. Photo: Diocese of Northern California, via Facebook. [Episcopal Diocese of Northern California] A great movement doesn’t always begin with great big steps. And young people in the Diocese of Northern California are discovering that when it comes to racial reconciliation and environmental justice, the small steps they are taking may help others to understand what it takes to break down barriers and truly become the family of God. From June 19 to 23, 24 young people ages 14 to 18 joined with nine young adult leaders and 12 older leaders, the bishop and a couple of visitors from the Office of the Bishop to explore unusual and historic places where racial discrimination and environmental degradation led people to fight injustice. After a day of hiking through Yosemite, and talking about the national parks system and the prophetic voice of John Muir, they boarded a bus on June 21 to take them to California’s Central Valley, where they visited Cesar Chavez’s 40 Acres and Allensworth State Park, enduring 109-degree walks across nearly treeless farmland. Bishop Barry Beisner said he was awed and impressed by the depth of the involvement of the participants. “They really took seriously what it means to be followers of Jesus and I was taken with how responsive they were to the call to be part of the Jesus Movement. They were so authentic and involved in the music and liturgy. It was so inspiring to me. Another one of the older adult leaders was Beth Crow, youth missioner of the Diocese of North Carolina, who came to see how the program she started, Lift Every Voice, traveled across the country and was uniquely reborn as Pathways. This year, the Northern California group spent a sweat-drenched day in the Central Valley, but after dinner, they seemed very grateful for the experience. “I didn’t think I’d learn much more, since we had already heard about Cesar Chavez in school,” Giovanna Zampa from St. Paul’s, Benicia, said, “but being there where he was on his hunger strikes” — it made that history come alive for her. And most agreed that Chavez’s longtime personal assistant, Marc Grossman, who now works for the Cesar Chavez Foundation, not only provided a wealth of information on the United Farm Workers movement then and now, but spiced up the talk with personal recollections of Chavez’s meetings with growers, politicians (including Robert Kennedy) and world leaders, and the toll his work took on his personal life. “I never got bored – I’ve met presidents and movie stars – you name it,” Grossman said. Allensworth provided another perspective, one that is not well-known: The Col. Allensworth State Park is the site of a failed farming community that had started as a place of refuge for African-Americans after the Civil War. “It was sold as an agricultural community,” said park ranger Steven Ptomey, “and they were farming, farming successfully alfalfa, but then California had one of its worst droughts on record.” The land got drier and drier, and the soil became too alkaline to farm, he said. Ptomey led the group through the modest houses, the church and a glass-walled drug store that sold all manner of merchandise. Later, the group met to process all they had seen during the day, talking about race and how they personally felt about its role in their lives. They sang, they prayed, they thought deeply, but still many were in awe of the day. The insights would come later. “I was particularly struck by the curiosity, sharp minds and open hearts of all the participants. Both years I’ve learned so much from these young people, and I am inspired by them and their willingness to take on tough issues and to dig deeply with evidence of strong faith,” said the Rev. Mary Heller Taggart, a deacon at St. Paul’s, Healdsburg. Lift Every Voice, the North Carolina program that was a model for Pathways, started out as a “freedom ride” to civil rights sights around the state, Crow said. On the bus was the Most Rev. Michael Curry, who was elected presiding bishop of the Episcopal Church just before the ride. Because the ride was intended for the spiritual development and growth of the youth involved, the leaders decided they could not allow a media presence, since that would put the focus on Curry, Crow said. But it also hampered the spread of the program, she said. The second year’s program took a group, including six Northern California representatives, on a Pilgrimage of Reconciliation in South Africa, focusing on the history of apartheid there and on the work of the Truth and Reconciliation Commission. That same summer, the newly formed Pathways pilgrimage took a group of pilgrims to sacred Indian sites near the Oregon border and Tule Lake Segregation Center to learn what had happened when Japanese-Americans were imprisoned during World War II. Growing up in the area, a park ranger said she was told the stories that the camps were for the protection of those interned. – Lori Korleski Richardson is interim communications director for the Episcopal Diocese of Northern California. So proud of our kids and adults who participated in Pathways this year. Care of creation, justice for workers and Race are such important issues and this experience clearly broadened the participants’ understanding. Viewing Yosemite and our Central Valley through the lens of faith-what an enriching experience!